SUMMARY: Modern dog training perspectives in layman’s terms. This is the best summary I can muster. There’s no way to do it justice in a few words. AUDIENCE: If you’re professional, read it now, recommend it to your customers, give it to shelter adopters! REVIEW: The Culture Clash lays out the pillars of canine training, learning and communicating. Despite being steeped in fact and logic, the book reads like a lively conversation. Reading this book changed the course of my career, as every page I turned busted another bias, myth or misunderstanding. It felt like the confusion-tainted glasses through which I had been looking at dogs were being removed. I could finally enjoy my dog for what he was, without distortion or paranoia. I have built my career in dog training and behaviour therapy on the principles she uncovered for me: science-based and force-free training. It is such a great read that I read it in one week-end, hardly stopping to eat or sleep. A friend of mine, upon seeing the state of my copy, was outraged at the vandalism. You see, I tend ear-mark interesting passages in books. As every other page comes whacking you with another epiphany, nearly every page corner of my badly battered copy is now folded over. This should give you a feel for what an unmissable piece of dog training history this book is: it is included in the compulsory reading list of many animal behaviour qualifications. I just cannot praise the Culture Clash enough: it is fact-packed but hilarious; jargon-free but rigorous; and short but ambitious. 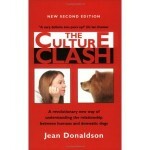 Whether you’re a first-time dog owner or experienced trainer, do not go another day without reading The Culture Clash. Browse the Book Review archive. Genre: pop science. Author: Donaldson Jean. Reading Level: Owners. Star: 5. Bookmark the permalink. Post a comment or leave a trackback: Trackback URL.